Lacretia Hardy is a health coach and has been a published writer since 1992. Her work has appeared in several publications, including "Patient In Charge," and on various websites. Hardy holds a Bachelor of Science in health science, as well as certificates in food and nutrition education and holistic health counseling. According to the U.S. Food and Drug Administration, or FDA, millions of people worldwide are taking vitamins to supplement their diets or for potential health benefits. Unfortunately, it might be dangerous to consume the wrong types, quantities or brand of vitamin supplements. 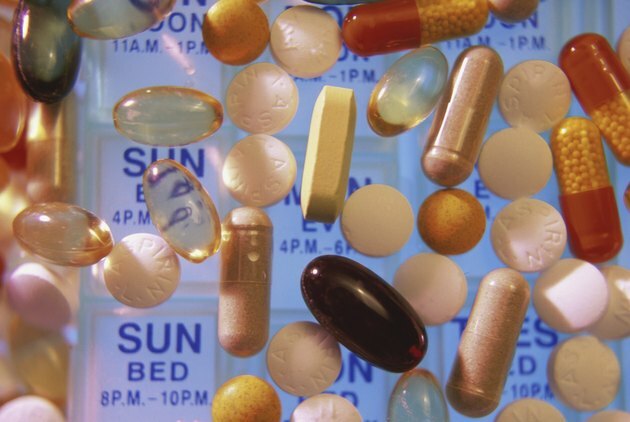 Some vitamins include toxic ingredients that can be detrimental to your health. To avoid potential health hazards, purchase vitamins from reputable manufacturers that guarantee safety and efficacy. Also, check with a health care professional about which vitamins might be right for you. All vitamins are not created equal. Synthetic vitamins are created using chemical compounds that are not found in nature. While they are not completely bad for you, your body cannot utilize them as they can natural vitamins, which contain ingredients from plants or food. Some of the chemicals used as the base for these vitamins include nicotine, coal tars and alloxal, which are toxic substances. According to the Organic Consumers Association, fat-soluble vitamins are especially dangerous in synthetic form, as they can build up in your body's fat tissues and liver. Because they are unnatural substances that your body cannot readily metabolize, the storage of these vitamins can be potentially toxic. Fat-soluble vitamins include vitamins A, D, E and K.
Many vitamins include additives to create the desired form, color, taste or weight. Unfortunately, some manufacturers use ingredients that carry risks that far outweigh their benefits. When choosing a vitamin, watch out for ingredients such as magnesium stearate or stearic acid, which are toxic flowing agents. Also avoid toxic ingredients such as silicon dioxide, which makes vitamins weigh more, and "natural flavors," a term often used for MSG, a toxic additive used to mask a poor-tasting supplement. Other toxic ingredients include methylcellulose, carnuba wax and titanium dioxide. The Merck Manual for Health Care Professionals reports that nine trace minerals should be consumed in very small amounts because all trace minerals are toxic at high levels. These minerals include chromium, copper, iodine, iron, fluorine, manganese, molybdenum, selenium and zinc. In addition, some vitamins, including vitamins A, D, E or K, can be toxic in large megadoses. The FDA warns that vitamin supplements should only be taken in the recommended dosage amounts to avoid the negative consequences of overdose. In March 2010, the Mateel Environmental Justice Foundation commissioned testing on several fish oil supplements. It was found that the supplements contained PCB, a cancer-causing chemical that was banned from use in 1979, but is still present in the environment. The group consequently sued the manufacturers of these supplements, including CVS Pharmacy, GNC, Now Health Group, Omega Protein, Pharmavite, Rite Aid, Solgar and Twin Lab. A May 2010 article in the "New York Times" reported that almost every herbal dietary supplement tested in a congressional investigation contained trace amounts of contaminants such as lead, mercury, cadmium and arsenic. Sixteen of the 40 supplements tested also contained pesticide residues. The FDA reports that, while the government is responsible for corrective action, it is the responsibility of supplement manufacturers to ensure safety. For this reason, choose a manufacturer that can prove that safety testing has been done on both the supplement ingredients and the finished product. How Can I Verify Which Vitamins Are Better?